Well done to all those who had a go at the puzzles over the past five days. 24 December - (answered correctly by Andrew Shephard), as follows: "Play e3 followed by c3 but leave the d-pawn on d2. The crucial thing is that the black rook will only have one check. The white king manoeuvres from b3-a2-b1-c2-d3-e2-f1-g2-f3 after which the black rook must capture on g3, opening up the third rank for the white rook. Then the white king heads back from f3-e2-d1-c2-b3-a2. After ... Ra3+ white plays Rxa3 mate." 25 December - (answered correctly - on his second attempt) - by Dave Green: "Qc5 seems to lose all sorts of stuff but if the rook takes on c5 then Nd4 is mate. If d6xc5 then Rd5 is mate. If the king takes the rook on f5 then Qxd5 is mate again." 28 December. First puzzle. What was Black's last move? It must have been e7-e5, so 1. dxe6 e.p. with various mates to follow next move. Second puzzle: 1. O-O-O. Mate follows next move with either Rd8 or Rh1. Hope you enjoyed these puzzles. A bit of recent tournament news - Silas Peck played in the CCF (Coulsdon) Christmas Congress (under 1950 section) 21/22 December and scored 5/5. Congratulations! There will be no more postings here until Monday 6 January, as I'm off to Devon and Cornwall for a week. Back to work today? Bad luck! Here are today's puzzles - two of them as they're not too difficult. After the first (key) move, there are a couple of variations for you to consider. Here's the puzzle for Christmas Day, in the shape of a Christmas tree of course. This is the first quiz of the Christmas season. There will be one each day from now until Saturday. The answer to this, and to the other puzzles, will be given on Sunday. You can probably find the answer to most of the puzzles online, or by asking the chess program on your computer, but give them a go yourself! Here's the final mid-season summary, for Suffolk League Division 1. Unfortunately, postponements have given the league table an unbalanced look. Only three of the six teams have played all five games, and Ipswich C have played only three. So the two Bury St Edmunds teams top the table, but it's easy to see that Ipswich C could easily jump into the lead if they win their outstanding matches. Most matches have been closely fought, showing how little there is between the six teams. Until 11 December, the largest win was 3 - 1. Individually the leader is Ed Player, on 3½/4. He is followed by Nick Savage on 4/5, Keith Woodcock (3/4) and John Peters (4/6). There has been an excellent response to Dave Green's recent article. If you would like to contribute to the debate, please click on the 'comment' link from that page. From tomorrow, Christmas Eve, there will be a series of Christmas puzzles. This will continue every day until Sunday 29 December, at which point I will be disappearing for a week's holiday! With each team having played six matches, there are just four points between leaders Ipswich E and bottom-of-the-table Bury St Edmunds D. Pre-season favourites (and last season's relegated team from Division 2) Clacton are only a point and a half behind the leaders. Another round of matches in January could see the table almost turning upside down. Felixstowe have been boosted by the arrival of Phil Hopkins, who has scored more than 50% of his team's total points. Clacton have so far fielded the strongest teams, averaging 129. Next is Manningtree B, averaging 122. The remaining teams are bunched closely between 117 and 111. The individual table is led by two players who have won all six games. Unsurprisingly, Phil Hopkins, at 171 the highest graded player in the division, is one. The other is 76-year old Roger Smith (106), on board 3 for Ipswich E. His only losses this season have been in the Bury Congress. 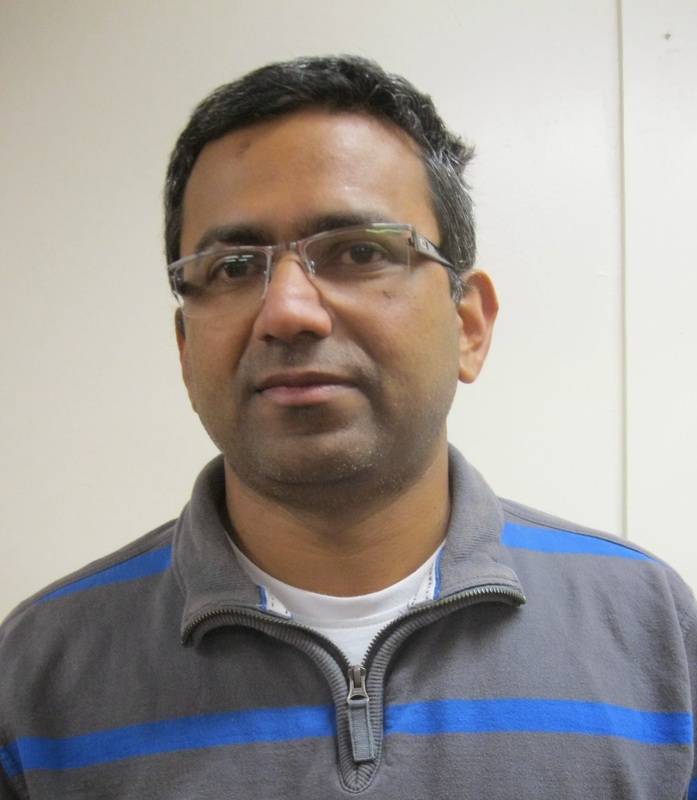 Does nominating teams matter in today's SCCA leagues? It appears that nominating teams using player’s names and grades no longer commits those nominated players to play a single game for the team for which they were nominated. We are half way through the season and, according to the grading database, a total of nine players across the three Suffolk league divisions have not made an appearance for the team for which they were nominated. I feel that this is not right. Am I right? I hope to show in this article that the rules are being breached but there is some doubt because the rules lack the required clarity. Let us now look at the Rule Book for guidance. I have added words in italics where I feel the rules need to be amended. Rule 20. "Each club will provide a list of nominated players with grades for each team entered in the League. A player may be nominated for different clubs, provided these nominations are for teams that play in different divisions. If a club plays a match without having nominated any players then for the purposes of these rules that club shall be deemed to have nominated the four players who took part in the match and in the same board order." Rule 21b. "Nominated players should play (for the team for which they are nominated) during the season. If this is unlikely then a different player should be nominated." This is a very wishy washy rule; for a start the question of where in the SCCA competitions the player has to play to be compliant arises. Specifying this as the team for which they are nominated would make this rule clearer. 1) “Should” implies an aspiration not a compulsion. So what happens if the rule is ignored as widely as it is at the moment? 2) Is one appearance during each half of the season enough to meet this “should” aspiration? 3) If more than one appearance is needed to meet the aspirations in rule 21 then who decides what number of games a nominated player “should” play to avoid the need for either renomination or the risk of being sanctioned for a breach of the rules. The rule also expresses the aspiration that a team is expected to nominate someone else to replace a nominated player who is for any reason unable to play during the season. How is this to be enforced or does it not matter that the rule is being ignored? What sanctions are to be applied for failing to meet the aspiration expressed in this rule? a) Need rule 21b at all if we are going to ignore its aspirations? b) Accept that we need the control this rule aspires to produce and then come to an agreement as to how many games are required to meet the expectation expressed here? c) How is the rule to be enforced? We need to decide, if enforcement action is required, then who does the enforcement and what sanctions need to be made available to ensure compliance with any enforcement instructions? Rule 22. "Players must be bona fide club members. No player may be nominated by a club for more than one team at the same time." This must follow from Rule 10 where substitutes must be bona fide members of the club for which they are to play and Rule 20 where nominated players must be club members. Thus there are only two classes of player: nominated and substitute, so that means Rule 22 part 1 adds nothing to our rules that is not covered elsewhere. Rule 22 could then include the following to make the action required by the competitions secretary and the clubs crystal clear: if a player is nominated for more than one team for the same club in the Suffolk leagues then the competitions secretary will reject this incorrect nomination and ask for a nomination that meets this rule. Rule 10 states that substitutes in the event of “unavoidable absences” have to be bona fide (NOT F.I.D.E.) (Just replace the Latin with "genuine or authentic") members of the club". “Unavoidable absences”. This phrase restricts the ability of clubs to rest players or to play other members who wish to play in the league as these “absences” of the nominated players are voluntary and clearly are not “unavoidable” so here the rule is too prescriptive. Rule 27 deals with the idea of ineligibility. It appears logical that a contravention of the aspirations of any rule relating to nominations should be those associated with ineligibility. However all the time that we seek to make these rules more formal and binding we must not lose sight of the need to play for and win the league title over the chess board and not in the “stewards room”. Maybe we can discuss this all at the Suffolk AGM or at a committee meeting so that the new competitions secretary, who will have to be found to replace Mike McNaughton when he relinquishes his post at the end of this season, has a set of non-wishy washy rules we have all agreed and agree to obey. With the league matches completed on Tuesday, 11 members of the Bury St Edmunds Chess Club met this evening for a five-round 15-minute tournament. The tournament was won by Scott Taylor (far right in the photo), who scored four points out of five. He was beaten in the final round by Richard Lamont, but won on sum of progressive scores. Scott received a bottle of champagne for his efforts, whilst Richard won a box of Belgian chocolates. The Junior prize was shared between Patrick Gembis and Fraser Fallows, both on three points. The best result of the evening was in Round 2, when Dave Clark (97) beat Richard Lamont (171). Tune in tomorrow for an interesting article by David Green (Stowmarket) about the current rules for nominating players. When will Chess Clubs in Suffolk be open over the next two or three weeks? With Christmas and New Year fast approaching, it would be good to get a list of clubs' planned opening dates. There are no league or cup matches due to be played until the second week of January. The only known one is Bury St Edmunds Chess Club; it will be open tomorrow (Thursday 19th) when a Christmas 15-minute tournament will take place (everyone welcome). It will be closed on 26 December and 2 January, re-opening on Thursday 9 January. Will other clubs please post here (click on 'Comments' below) and let everyone know when your club will be open or closed. The last match of the half-season in the Bury Area Chess League Division 2 was played this evening, with Linton Blacks beating Bury St Edmunds C 4 - 1 (remember, there's a bonus point for a win in the BACL). One outstanding match, between Linton Blacks and Cambridge Oddfellows, has been postponed to 28 January. It's no surprise that two Cambridge teams head the table. Last season saw one Cambridge team relegated from Division 1, the first time for many years that Cambridge were left with only two teams in the top division. With Dons and Oddfellows well ahead of the rest of the field, it's just a matter of which team will achieve promotion. They won't face each other until late-March. Three of the above have played for more than one Cambridge team. Not all teams have played the same number of games, as the match between Stowmarket A and Saxmundham A has been postponed. There is very little to choose between the six teams. Adastral Park leapt to the top of the league by whitewashing Stowmarket A recently. But when the outstanding match has been played, there could be as little as two points between top and bottom. So there's everything to play for in the second half of the season! On paper, Saxmundham A has the strongest team, with Dave Brown (175), Malcolm Lightfoot (163) and John Feavyour (151). But results have not been kind to them, including an error in their first match, when boards 2 and 3 played in the wrong order, resulting in the loss of 1½ points. This would have been their only win of the season. Several teams have strong players on their top boards. As well as Saxmundham's Dave Brown, Stowmarket A have Richard Lamont (171), Sudbury Rob Sanders (171) and Bury St Edmunds John Peters (169). The Player of the Season trophy is led by John Peters, who has won all five of his games. He is followed closely by Ed Kirkham (Adastral Park), on 4½/5. Results - Results - Results! Three Suffolk players have competed in tournaments that finished today. Silas Peck played in the London Chess Classic FIDE Open; Dagne Ciuksyte was in the Womens' Invitational event that ran alongside the London Chess Classic; and Anita Somton played in the London Junior Chess Championships. All three performed with great distinction. Silas (1803 Elo) entered the FIDE Open, where 23 GMs and a similar number of IMs were included amongst the 188 entrants. Eight of his opponents were higher-rated than him, but Silas scored 3½ out of nine with a performance of 1887. Dagne (2345) was second seed of just six entrants, who played each other twice over the five days of the event. She was the clear winner on 7½/10, half a point clear of the runner-up. Her five wins and five draws gave her an excellent rating performance of 2434. 30 children played in an end-of-term Christmas Tournament at the Bury Knights Junior Chess Club last evening. Everyone won a prize! With ages ranging from 5 to 14, there was a huge range of ability, but this was evened out somewhat by a piece handicap system. The stronger players had to give up a rook, or two pieces, or sometimes just a pawn or two. Nevertheless, most games were won by the higher-rated player. The winner was William Sait, who won all four games. Second place on 3½ points was shared between Anita Somton and Alan John. 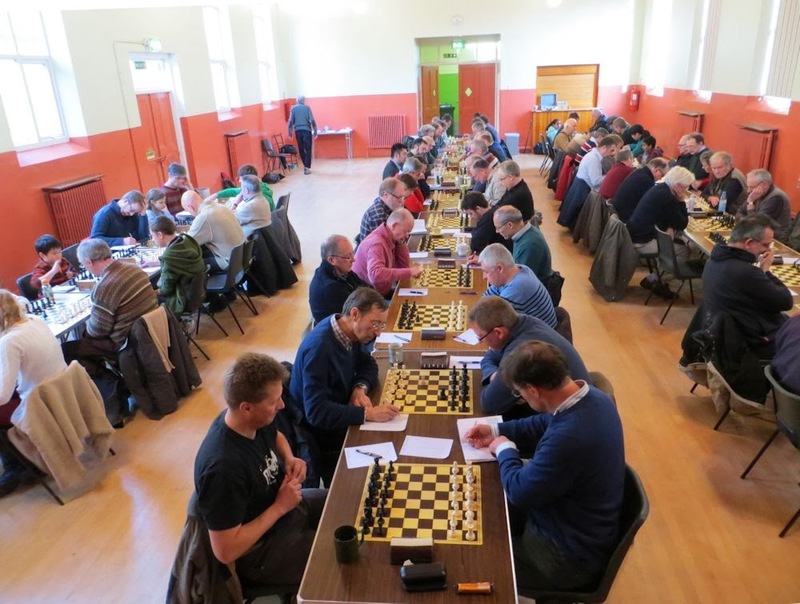 The second division to complete its half-cycle is Division 3 of the Bury Area Chess League. Newmarket Thoroughbreds were apparently coasting along with five wins out of five, but came unstuck in their last match against Linton Whites. Nevertheless, they reach the halfway point a full four points clear of their nearest rivals, Cambridge Gowns. Over the next week or so, as the various divisions complete their half-cycle, we'll be reporting on their progress. There are six divisions - three in each of the Suffolk League and Bury Area League. The first to complete is the Bury Area Chess League Division 1. Current Champions Linton A have an extremely strong team. They usually have Paul Kemp (189) on Board 4. And if they need a reserve, they can always call on Norman Hutchinson (175). But as can be seen from the table above, they are not exactly running away with it. Cambridge Examiners are close behind. These two teams meet again early in the New Year in a match that may well decide the fate of Division 1. Individually, the leading scorers come from these two teams. Leading the way is 15-year old Akito Oyama (Examiners) on 5½/6, followed by David Coleman 5/6 and Kevin Clark 4/5 (both Linton), and 14-year old David Redman (Examiners) on 4½/6. The Examiners team, captained by Master Redman, is a good example of the stream of strong juniors emanating from the Cambridge stable. With Ashley Stewart and Chris Davison now in their early 20s, the reins have been taken up by Akito and David. Waiting in the background are the next generation: 12-year old James Xu (157) and Austin See (111). Click here to view further information on the BACL Division 1. Whilst the 'Super Sixteen' has now started, with many of the World's top players competing (including Anand, Kramnik, Caruana, Gelfand, Polgar, as well as England's Michael Adams, Luke McShane, Nigel Short and Gawain Jones), the FIDE Open has progressed to Round 5. In accordance with the rules of the Open, the two top players after four rounds (Sutovsky and Istratescu) have moved to the 'Super Sixteen', where they have to learn to adapt quickly to Rapidplay chess. Progress (and the games) can be seen live on the ChessBomb site. Or click here for the main site of the London Chess Classic, with live commentary every afternoon this week, until Sunday. Last Saturday, we reported on the new Under 11 Team Manager, Boby Sebastian. Today we have received details of the 2014 Inter-Association Championship. The Under 11 Zonal will be held on Saturday 15 March. Suffolk will compete in the East Zone, alongside teams from Barnet, Cambridgeshire, Essex, Hertfordshire, Kent, Leicestershire, Northamptonshire and Richmond. The venue is Chingford Foundation School, E4 7LT. It's about an hour and a half's drive from Ipswich, and an hour and a quarter from Bury St Edmunds. As last year, Norfolk have not entered, which means we can co-opt some of their players. We will be in contact with the junior organisers in Norwich. Half of last year's 20-board team will be available for selection, led probably by Anita Somton (Board 4 last year) and Mario Saenz de Villaverde (Board 5 last year). It is hoped to be able to hold a Training/Selection Day in February before half-term, either in Bury St Edmunds or Woodbridge. More details soon! Thanks to Michael Clapham for providing the following two gems - and for being prepared to provide examples of games he lost so swiftly! Today the Suffolk Under 160 team lost both their matches. In the morning, against Hertfordshire, Suffolk were a player short because one player was ill. So, starting with a 0 - 1 deficit, things went from bad to worse. With just two games remaining, Herts led 10 - 4. But excellent finishes by Phil Hutchings on Board 4 and John Feavyour on top board, helped to make the final 6 - 10 result a little more respectable. Hopes were high for the afternoon match, where Suffolk outgraded Norfolk by an average of five grading points per board. But again, things went badly for Suffolk, and with just one game remaining (mine!) the scores were tied at 7½ - 7½. Despite being a hard-earned pawn ahead, it proved too difficult to keep my king protected and I eventually succumbed to hand Norfolk the win by 8½ - 7½. Congratulations are due to Phil Hutchings, the only Suffolk player to win both games. On 1½ points were Andrew Shephard and Vivian Woodward. Many thanks to Anita Somton for turning up for the afternoon match - and winning! To see the full results on Dave Wild's website, click here. I'm pleased to report that Suffolk has a new Manager for the Under 11 Team. He is Boby Sebastian, father of 10-year old Alan John, who attends the Bury Knights Junior Club. Boby replaces Laura Cortabarria, who did such an excellent job last year when the Under 11s travelled to Northampton for the first time in several years, to participate in the National inter-County competition, as reported here. The Under 11 Zonals take place in 2014 on 15 March, in Essex. That will be a much easier venue for our team to get to. It's hoped that as many Suffolk Under 11s as possible will play in the Bury St Edmunds Junior Congress taking place three weeks beforehand, on 23 February. That will give Boby an opportunity to spot any latecomers and to decide on board order for the 20-board team. It's likely that at least half the team will be found from the Bury Knights, with The Abbey, Woodbridge, providing several others. Other possible sources include primary and middle schools in Needham Market, Creeting St Mary, Debenham and East Bergholt, as well as several in Ipswich. Teachers and/or chess organisers in these schools should contact Boby with suggestions for the squad. We are allowed to take up to four reserves, who are able to play in a separate tournament. Anyone wishing to contact Boby directly should email him. On 29th September 2012, a new website was launched dealing with all aspects of Suffolk Chess. The editor of this site, Bob Jones, has long been known in the East Anglian chess world for his innovative ideas that have improved the Suffolk chess scene for many years. 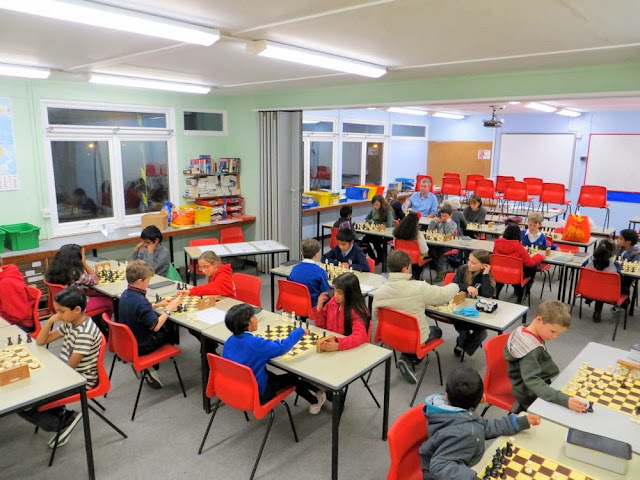 The Suffolk Chess website today celebrates its 300th entry and there has been something new every day since the start of the current season on 1st September. I am honoured that Bob has asked me to mark this occasion with a few words. Of course, keeping a site so consistently fresh on a virtually daily basis is not an easy task and I know that Bob would welcome more contributions from players of all abilities, whether it be interesting games, news from clubs or just local stories with a chess interest. Bob first asked me to write something around the time of the 100th new entry on the website, so my response time has not been exactly spectacular, but even so, I believe that we should all try to support this site, not only by following it regularly, but also sending in contributions. On the whole, it has to be said, chess players are not the best when it comes to putting back something into the sport that gives them so much pleasure. Chess is a cheap game to play and I don't know of any other sport that, at the local level, offers the opportunity to win such decent prize money as chess tournaments do. 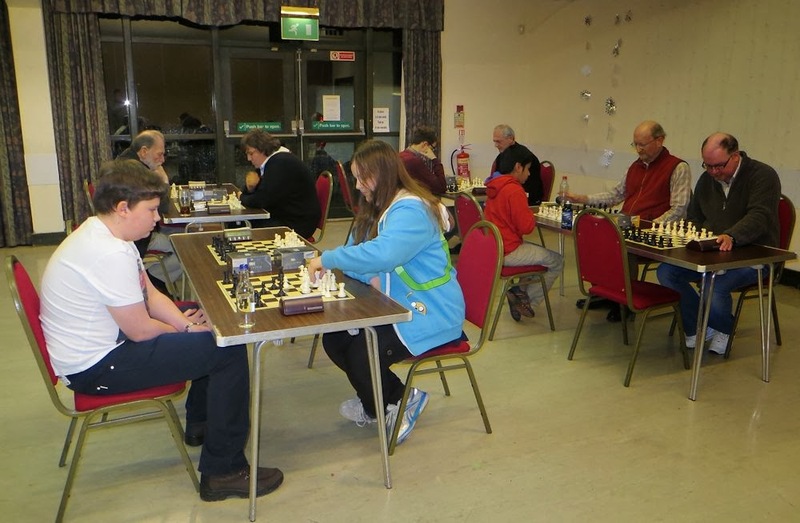 There are plenty of opportunities to play chess, in club competitions in the evenings and at County and tournament level at weekends, but none of these would exist without someone to organise them. We are fortunate in Suffolk to have one of the finest tournaments in the country in the form of the annual Bury St Edmunds Congress, which next October will take place for the 32nd time. Again, we have Bob Jones to thank for the high standard of playing conditions in this event. The 2014 Bury Congress will be the sixteenth that Bob has organised and at this point, having run half of the Congresses held so far and seeing a certain symmetry in terms of 32 representing the number of pieces on the board at the start of a game and his 16 tournaments therefore, a 'full set', Bob has announced his intention to stand down and actually get the opportunity to play in this event again. We should be grateful to Bob for taking over an already vibrant event and taking it to new heights. Now is the time for a new team to come forward to continue the tradition of fine tournaments in Bury St Edmunds. As I mentioned above, as a group, chess players are not the best at coming forward to help organise the game and the majority of the work always seems to be left in the hands of a small cohort of willing, and often unappreciated, volunteers. I remember a few years ago at the Bury Club Annual Meeting, hearing in disbelief a player who was asked if he would take on the captaincy of his team for a year, answering, "Oh, no! I don't mind playing, but not captaining," as though he was actually doing the club a big favour by merely turning out to play for it! Chess events at all levels need people to run them. It is not exactly difficult or excessively time consuming, but it can be very rewarding. So let me close with a request for volunteers for a new team to run the Bury Congress as well as to step into the posts of Suffolk County Chess Association Vice President, Junior Organiser, Competitions Secretary and First Team Captain. The first two of these posts currently lie vacant and the other two will become free soon. Without organisers there will be no chess, so please consider helping to run the sport that provides you with so much enjoyment. Last Saturday 9-year old Anita Somton played in the English Girls Championships, held in Nottingham. In the Under 10 section she faced 17 other hopefuls. After winning her first two (rapidplay) games, she drew the third after running short of time. She then won her least two games to finish on 4½/5. In any normal five round event, such a score would be almost certain to win, or at least share first place, especially with such a small number of entrants. But somehow, Susie Wang managed to sneak past her to score an unbeaten 5/5 to take the title of English Girls Champion. It was especially annoying for Anita as she had beaten Susie in an Under 11 event in October. 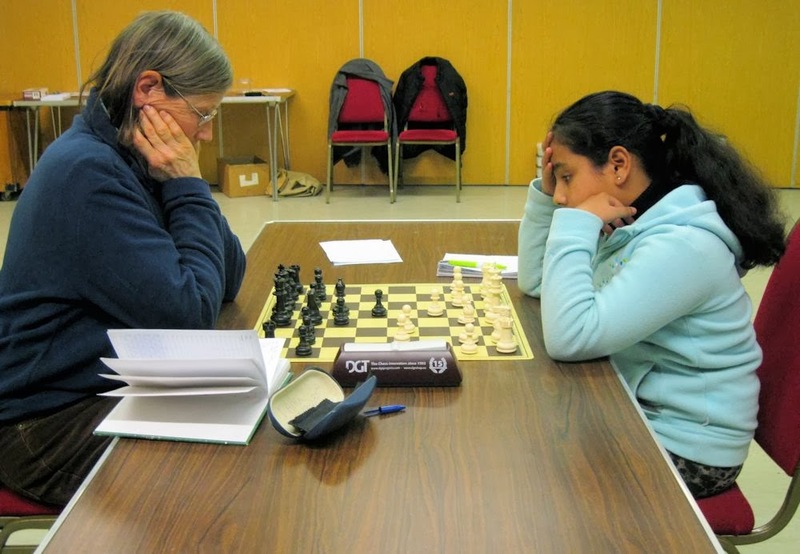 In the last round Anita had managed to beat the current British Under 10 champion, Arushi Ramaiya. This evening at the Bury St Edmunds Club, Anita faced former Suffolk Ladies Champion Vicky Allen in the Suffolk Ladies Championship. This year there are only four entrants: Vicky, Anita, Emilia Jewell and Bethany Young. Only two matches have been completed to date, with Emilia beating Bethany and, this evening, Anita and Vicky drew their match after a long struggle. Last season's eight-board Suffolk correspondence team finished in mid-table after an excellent start. Games that continued a long time tended to be lost for the Suffolk players. Each team member plays two games against the same opponent, as White and Black. All games are played on the ICCF Chess Server. Games can therefore be played quite quickly, provided both players respond promptly to the emails they receive when their opponents make a move. In days gone by, postal chess could last several years! There will be an update on progress in the competition early in the New Year. The Suffolk Under 160 team will be playing at the Turner Hall in Newmarket on Sunday. The other teams in this EACU Championship are Cambridgeshire, Norfolk and Hertfordshire. Although there are more than 30 players graded between 140 and 159, it has proved extremely difficult to find a full team of 16 players. Nevertheless, we hope to be able to put on a good performance and to qualify for the National quarter/semi-finals. The other dates for the Under 160s in 2014 are Sunday 26 January and Sunday 16 March. A new film by Andrew Bujalski called “Computer Chess” is being shown at the Ipswich Film Theatre in the Corn Exchange on Tuesday, Wednesday and Thursday this week. There's a two-minute trailer that you can watch. The film's own website can be seen here. The advertising spiel says, "In the early '80s a group of computer programmers gather in a hotel with the aim of winning a competition to design a programme that will beat a human at chess. From a broadly comic beginning the film shifts imperceptibly into a genuinely profound, and surprisingly moving, philosophical musing on the relationship between man and machine. Thoughtful, engaging, funny, this is a genuine surprise." The film won a $20,000 award at the Sundance Film Festival, held in Utah, USA in January 2013. Ted Matthewson says he's going to see it on Wednesday or Thursday, so we look forward to hearing about it. Whilst December is traditionally a quiet time, with most leagues finishing mid-month, 2014 will bring a host of events to attract Suffolk players, both adults and juniors. For more information about any of the above, email me.